Thank you. It givre me Sch pleasure to know that projets have shared Curlews beauté and calm. A lovely spot, but the house is not, by any means, in the shape to be let. was insufficient and ran out before the tub was hardly filled, unless you were a duck. tourists and ruin the reputation of what is given in exchange for payment. Waouh you are very harsh. I'm certaintly very sorry for all the troubles you had during your stay. I have decided that the house is not suitable for winter breaks and have taken it off the market for the rest of cold season. Why do guests pay for their electricity? Everything is on programs so each guest can choose according to their number & needs. We loved staying at Curlews and were so sorry to have to leave. It was great as a base for touring the area and a joy to return to in the evening. Our closest "neighbor" was a heron, and we enjoyed watching the fishing boats pass as they went about their work. Our other neighbors - the human ones - could not have been more friendly and helpful, though we did not see them often. They were lovely, just as one can expect when in Ireland. The house itself was cozy and comfortable. We had fires in the evening and the timer for the radiators was set just right so that the house was nice and warm each morning when we got up. When we first got there, there was a slight musty smell due to the place being closed and unused for a time, and obviously because of it's proximity to the sea. Our own home, which sits close to the Columbia River and the ocean nearby, does exactly the same thing so it didn't bother us a bit. Also this: we read in another review the complaint/suggestion that the owner should put a sofa or couch in the living room in place of the chairs as they are now to which we say, "Please Don't!" We're unsure how you'd place a couch without impeding the view, and the arrangement as it is couldn't be more perfect for looking out to the sea while having a cup of tea and a piece of brown bread and marmalade. We would recommend this cottage to anyone. Thank you so much! I'm so pleased yu enjoyed your stay and it's wonderfull to feel how you got Curlew's atmosphere. My husband and I stayed at Curlews in September, 2017. 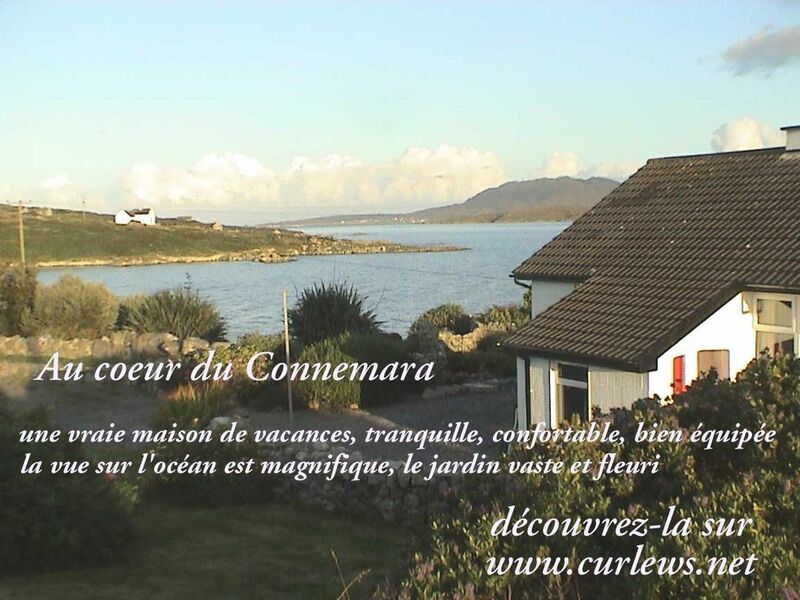 The cottage setting is in a great location by the sea/bay with lovely garden plantings. We did have difficulty initially finding the cottage as the directions did not match the colors of the landmark houses. The cottage itself is comfortable with a very well equipped kitchen. The windows in the living room overlook the bay,. There is a binder with information for the area which was helpful. There were also additional cottage instructions in the binder however they were in French which we were unable to read. Location is good for exploring Roundstone, Clifton and hiking in Connemara(national park about an hour from the cottage). thanks for reminder to leave instructions in english. Shall be included from november onwards. Beautiful country and lovely people. The house needs updating and new mattresses. No sleeping there! The grounds and surrounding countryside are spectacular. The house works, but is damp and needs updating. A good, comfy couch for reading on rainy days would be a plus. The beds are awful and sore bones ensued. Most things work, some are broken. We did enjoy our stay and loved the natural beauty of this area. I believe the owner will be updating, which in case, we would visit again. Loved Ireland and its wonderful natural beauty. Thanks for your feedback. It seems a bit harsh to me. The twin beds are orthopaedic beds, one double bed is only 2 years old. I shall check the breakages you mention because on this level we ( the caretaker & I) replace immediately any appliances that do not work. As for dampness I'm more then astonished. Tthis house can stay closed for months without any objectif signs of dampness. Sehr schöne Lage, direkt am Meer, nett und freundlich ausgestattet. Guter Kontakt mit der Vermieterin, Aufenthalt sehr freundlich betreut von der in der Nachbarschaft wohnenden Dame. Carna (10km) is capital to lobster fishing and the Gaelthacht area Friendly pubs and 2 restaurants will be happy to welcome you.